Anthony Jeselnik is a relatively new face in American television. The self-stylized provocateur has scaled the ladder from late-night comedy writer to TV host through six years of hard work, bad taste and self-righteous sermons. His first special, Thoughts and Prayers, debuted in October 2015, and as far as introductions go, Jeselnik is about as ham-fisted as a pig made of fists. While Jeselnik's special is not without its funny moments, the first 15 minutes are difficult — nay, excruciating — to watch, to say the least. To be fair, Jeselnik probably has no intention of making his stage persona at all likable. He is arrogant, bent on breaking the world record for the number of times one can state opposition to political correctness on camera. One would hope that while portraying a caricature so detestable, Jeselnik would be able to compensate with his delivery, wit or timing. No such luck in the first quarter of this. With nearly every gag preceded by the phrase "and for my next joke" or some other equivalently extraneous mouth-fart, his introduction was reminiscent one of a down-on-his-luck magician — tacky and out of touch. His early jokes are also juvenile without the saving grace of anything particularly ridiculous or unexpected being said, prompting implicit punch lines such as "Because domestic abuse is widely frowned upon!" or "Because projectile rocks are harmful to small infants!" And it's no laughing matter, there may well be a reasonably clever ten-year-old in an L.A. schoolyard who wants his jokes back. If you possess the mental and moral fortitude to withstand the cringe-worthy first quarter of Thoughts and Prayers, it might be worth hanging on for another 15. A little comic relief has never been more needed. 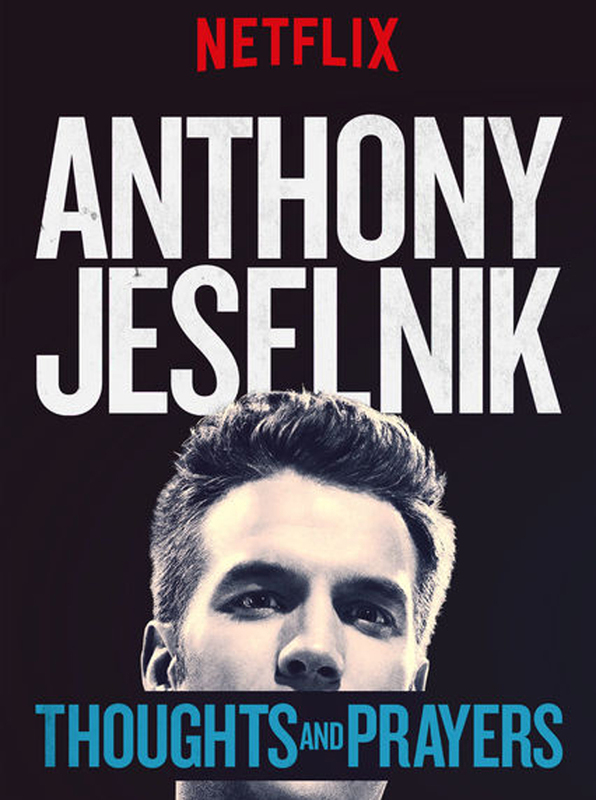 Jeselnik comes into his own for a surprisingly well-written and delivered 20 minutes of genuinely funny, clever and dark material. He seems to become a little less insufferable in spite of himself when given some decent material to work with. His jokes are often pointed, at times even multi-layered. Though not without a few clunkers, this middle tirade of Thoughts and Prayers nearly saves the special. Having gathered some steam, Jeselnik takes the leap from comedy club to pulpit. He begins pontificating on why he loves telling jokes, why comedy is important personally, politically and socially. However, what starts off as mildly interesting if not necessarily that funny soon dissolves into almost 15 minutes of self-serving preaching with only rare glimmers of anything substantially funny, memorable or vital. Jeselnik's Thoughts and Prayers is regrettably a train wreck, with a few brief sparks of ingenuity and all too few genuine chuckles. Watch the middle if you must; watch the rest at your peril.